This 70 mile route goes south from bristol and then heads west to take in some of the best scenery in the area around the Mendip Hills and also provides some good climbing up Dundry Hill for a great view of Bristol as well as the infamous Cheddar Gorge to get the legs warmed up! The route starts by going through Ashton Court and then south over Dundry Hill, you then head past Chew Valley Lake and south head towards Chewton Mendip and then Wells. 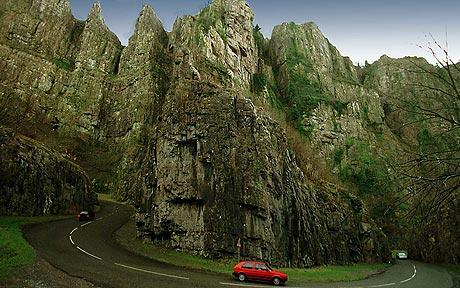 Once in Wells take the A371 West to Cheddar and then climb up through the gorge. Once at the top of the gorge continue to follow the road until the end where you turn left and left again onto the B3134 towards Burrington. Once at the bottom of Burrington Coombe follow the road straight over towards Langford and then Wrington. From Wrington turn right upto Redhill and onto the A38 which you follow for about 4 miles before cutting back through to Ashton Court.